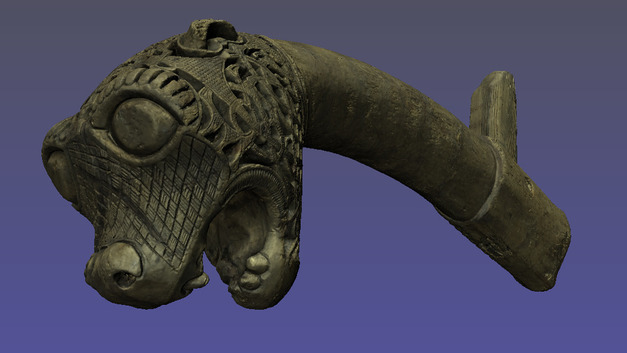 Now you can examine artifacts from the mysterious Oseberg Viking ship in 3D. The ship built in year 820 AD, buried in a mound with two elderly woman in year 834, is the best-preserved Viking ship ever found. The Museum of Cultural History in Oslo has 3D scanned ten objects that you can study in your browser. You can both zoom and watch them from all angles – something you cannot when they are behind locked glass at the museum. The system, ShareMy3D, works on computers, mobile phones and tablets. You can study the elaborate objects here, and if you click the HQ button in the menu bar at the bottom, you will get a better version of the model. This requires a bit more of the hardware and takes a little longer to download. Other possibilities include taking measurements, see the cross-sections and adjust the light. If you click the Document button to the left of the HQ button, you will get an article about the object – which unfortunately only is in Norwegian. However, if you are curious and want to learn more, copy the text and use Google Translate.